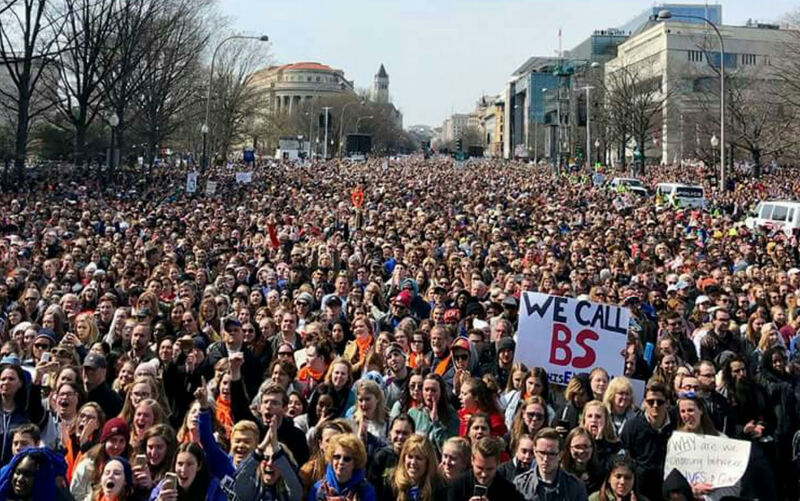 Washington, DC, March 25, 2018 – In what could very well be a defining moment in America’s history, scores of activists flocked to the nation’s capital to demand an end to gun violence and mass shootings in schools and communities, an epidemic that has for long been plaguing the nation. David Hogg, survivor of the deadly shooting rampage at Marjory Stoneman Douglas High School in Parkland, Florida, lamented that every day, 96 people are killed from gun violence in the country. “Let’s put the USA over the NRA”, he said. “To those politicians supported by the NRA that allow the continued slaughter of our children and our future, I say get your resumes ready”. Congresswoman Pramila Jayapal (Democrat – Washington) proudly highlighted her ‘F’ rating from the NRA. The pro-gun advocacy group gives members of Congress a grade ranging from A to F that reflects their voting record on the right to bear arms. Inspired by the demonstrators, Congressman Raja Krishnamoorthi (Democrat – Illinois) vowed to “keep fighting for real gun reform in Congress with the knowledge that today is only a beginning”.